Charity's Crazy Beautiful Life: A boy and his dogs, how precious!!! A boy and his dogs, how precious!!! Nicholas asleep on Colby's bed a few nights ago. Nicholas takes turns, but is always asleep with one of the kids. 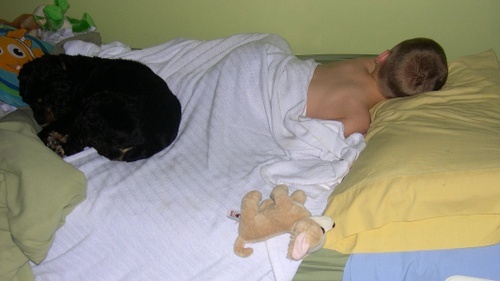 And of course, what little boy could go to sleep without a Webkinz chihuahua named Mojo??? A boy and his dogs, how precious!! Your kiddos inspired me to go to the gym tonight! That is great that they are active and enjoying the outdoors, even if it is rainy outside. Hope you all are well! I just want to squeeze you colby! A boy and his dog! My wonderful & perfect future son-n-law and his dog is what I see. BTW, I have 20/20 vision. Love you, Colby-sticks.